I collect Girl Scout council patches, council pins, council camp patches, council anniversary patches, bandanas, foreign patches, and Boy Scout Council Shoulder Patches. I have been trading Girl Scout Council Patches since early 1996, and I have completed over 700 trades! Since I am also involved in Boy Scouts, naturally I also got into trading Boy Scout Council Shoulder Patches. If you are interested in trading CSPs, please click here. I currently have all the council patches and MY QUILT IS COMPLETE!!! Please click here to see photos of my completed project! It is now hanging in my den for all the world to see! Much to my delight, my husband thinks it's really cool and helped me hang it up. If you're interested in reading about how I got started trading patches, click here. Also featured on this page are a pictures of an "out-of-print" patch and a patch from an extinct council. Girl Scouts of San Jacinto Council (formerly known as San Jacinto Girl Scouts) finally came out with their new patch in the fall of 2001. If you're interested in seeing the 2 former patches that I have, please , click here. If you want a TERRIFIC resource for trading patches, click this button. Here's what I am collecting these days. New versions of Council Patches. Although my quilt completed, I'm still on the lookout for new versions of Council Patches. I'm not quite sure what I will do with these since it is too late to add them to the quilt. Probably start another quilt. Or just sew them on to a blanket (a lot easier!). See my list of US GS Camps by clicking here. Since there are so many of these, I'll probably just sew them all on to a blanket (or more than one!) some day. See my list of US GS Council Pins by clicking here. Bandanas Since I have bandanas to trade (see below) I'd like to collect bandanas. If you have any local bandana, GS or otherwise, I'd love to trade! Foreign patches - Since I'm in Houston, Texas, that means outside the USA. Boy Scout Council Shoulder Patches. See my list of US Boy Scout Councils by clicking here. San Jacinto Council camp patches: Click here see pictures of these camp patches. I also have some San Jacinto earned patches to trade. I have not had a chance to get the requirements yet, but they are readily available and I'll get them next time I'm at the GS office. If you are interested, please click here. I also have some patches that I happen to have only one of that I would like to trade. If you are interested in these, please click here. This is the portrait of Juliette sitting with a pink dress on. It is not stitched, but it is a very pretty patch. I currently have several of these to trade. Please note the picture below does not look that great because the patch is kind of shiny and my scanner did not like that too much. Anyway, it looks better than the picture here. San Jacinto 85th Anniversary Bandana - only 2 left. This Bandana has a picture of Juliette Low in the middle, with large numbers 1912 and 1997. In a circle around her picture and the years are pictures of girls wearing uniforms throughout the years, and names of badges from all the years. Forming a square around this are the GS Laws, and finally on the edges, on one side is Braille, one side semaphores and one side sign language all saying Happy Birthday. On the fourth side it says San Jacinto Girl Scout Council Celebrate 85 years of Girl Scouting. This bandana is really cool (Sorry I don't have a picture.) I will trade the bandana for 2 patches. San Jacinto Outdoor Bandana - only 5 left. This Bandana has pictures of animals, animal tracks, knots, trail signs, how to fold a flag, how to build a fire, and more! It says San Jacinto Girl Scouts Camping is what I like to do along the bottom. This bandana is similar to the first aid bandana in that the entire bandana is covered with pictures and words. (Sorry I don't have a picture.) I will trade the bandana for 2 patches. Girl Scouting Is� - only 1 left. This Bandana is pink Girl Scouting is� and has pictures of girls doing Girl Scout stuff. Picture below. I will trade the bandana for 2 patches. San Jacinto does not have a pin, but I do have a pin from the San Jacinto Monument (San Jacinto is a battleground that our council is named for). Note: this is a different pin than I was trading before. When I went to the monument to buy more they were out. My heart just sank! Then the lady behind the counter said, oh, we have this pin. 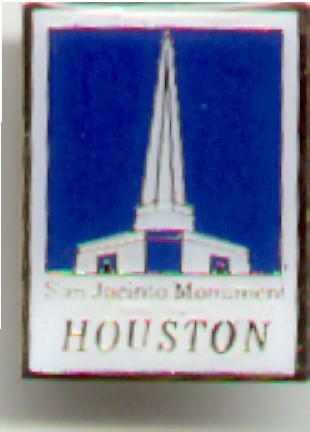 I think it's a nicer pin, still says San Jacinto Monument and Houston on it. -------> Well, I finally made it to the South Texas Council shop which is actually not very far from my house and has a very nice, friendly shop keeper who, it turns out, I met in San Jacinto Council when I first started out as a leader back in 1985! Anyway, I picked up a few council patches to trade, and some camp and earned patches to keep. I can get more of the earned and camp patches, so if you are interested, click here, and have a look at all of them and let me know what you would like. Boy Scout stuff: Please click here to see my list of available Boy Scout patches. I belong to the terrific patch trading ring (shown below). I highly recommend joining up if you want to trade patches!! !